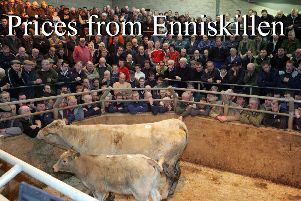 There was a great show of cattle at Wednesday’s sale in Saintfield with an exceptional trade throughout. Fat cattle sold to a top of £1110 for 610Kg AA Cow. COWS: Killinchy producer AA 610Kg £182 £1110, Ballykinlar producer Lim 680Kg £163 £1108, Newtownards producer Lim 670Kg £161 £1078, Crossgar producer Lim 740Kg £132 £976, Downpatrick producer Lims 770Kg £126 £970, 670Kg £138 £924, Comber producer Sim 690Kg £134 £924, Killinchy producer Lim 590Kg £154 £908, Kircubbin producer Fr 730Kg £122 £890, Killinchy producer Frs 710Kg £114 £809, 680Kg £130 £884, Kircubbin producer MB 680Kg £129 £877, Bullocks sold to a top of £1038 for 600Kg AA £173 for Crossgar producer, Killinchy producer Lim Bulls 980Kg £130 £1274, 710Kg £182 £1292. Leading prices: Ballykinlar producer Chars 880Kg £1690, 780Kg £1540, Dromara producer Lims 490Kg £1165m 480Kg £1105, Sim 550Kg £1015,Comber Producer Sim 550Kg £1230, Chars 620Kg £1140, 520Kg £1100, Ballynahinch producers AAs 620Kg £1235, 600 Kg £1205, 590Kg £1190, 580Kg £1150, 530Kg £1085,char 490Kg £1145, Seaforde Producer BB 620Kg £1175, AA’s 550Kg £1145, 550Kg £1075,Moneyreagh producer BB’s 640Kg £1130, 600Kg £1120, 610Kg £1105, Glenavy producer AA’s 530Kg £1150, 520Kg £1025, Lims 440Kg £940,Carryduff producer Chars 430Kg £1010, 480Kg £1045, 490Kg £1025,390Kg £940, Crossgar producer Lim 470Kg £1040, Ballygowan producer Lim 460Kg £1050,Chars 430Kg £1000, 360Kg £900,Greyabbey producer Lims 480Kg £995, 460Kg £900 Downpatrick producer Chars 510Kg £980,430Kg £945, 450Kg £935, Lims 490Kg £910, 420Kg £895, Ballynahinch producer Chars 350Kg £920,400Kg £900, 350Kg £900, Bangor producer Lim 360Kg £920. Leading prices: Comber producers Chars & Lims 530Kg £1120, 590Kg £1060,Lim 500Kg £900, Her 460Kg £915, Lims & Chars 480Kg £900, 490Kg £900 Downpatrick producers Lims 490Kg £1000, 510Kg £990, 470Kg £975, 470Kg £900, Glenavy Producer AA 490Kg £935, Lim 450Kg £800. Ballygowan producer Daqs 420Kg £980, 400Kg £865. DROPPED CALVES: Larger entry of 100 calves presented Bull calves sold to a top of £345 for BB, Heifer calves sold to a top of £310 for Lim.